The Golla Sunny 10.2″ Laptop Sleeve is perfect for anyone who wants a Netbook or laptop smaller than 10.2″ laptop sleeve. This sleeve is a more feminine product, and from The Real Mac Genius.com’s female part of the staff agrees that this is a very nice female sleeve. They argue that most of the laptop sleeves or bags on the market are more targeted for men. Not having many pockets or sleeves makes the bag appear more “male friendly”. However, the Golla Sunny appears in the more female category, displaying multiple flowers and in the lovely shade of purple. The main compartment in the Golla Sunny 10.2″ laptop sleeve is an enormous spot for you laptop. Since the sleeve is so small, there are not many spots to put pockets, just a compartment for the laptop. The laptop sits comfortability in the large compartment. Though there is not too much protection in the laptop sleeve, I do not think it would impeede on the safety of the bag. Though I do not suggest dropping any laptop whether it is in a case or not. The laptop sleeve has a convient handles which allow you to carry around your laptop easily. From testing the zippers, they prove to be extremely sturdy. In testing, no zippers broke, displaying superb manufacturing qualities of the laptop sleeve and a representation of Golla’s quality of products. 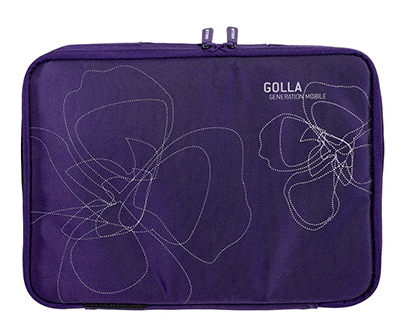 Since the size of the Golla laptop sleeve is little, the outside compartments are minimal. But, it is important to note that the bag posses a convenient sleeve for storing papers and the such. The Golla Sunny 10.2″ Laptop Sleeve is perfect for anyone with a 10.2″ laptop. With an attractive price, convinces, and durablility, I suggest this sleeve for anyone shopping for a 10.2″ laptop sleeve. The sleeve itself is very minimalist, thus, it this sleeve would only serve purpose on a trip to the Coffee Shop, not for an trip across the world. Important to note that with the bag shows great signs of durability. I would like to see a compartment for a charger in future versions of the Golla Sunny 10.2″ Laptop Sleeve, instead of using the outer pocket for a charger. Having a built in charger compartment would eliminate the need for an additional item to carry, and would be extremely nice just to carry a netbook and its charger and blog in Coffee Shops all over!